Dock Installation has a well deserved reputation for being the most hated chore a cottage owner has to tackle each year. Those who hate it usually have the same situation - a heavy all pine dock that requires 100% augering. You know the drill, call some buddies, buy a case of beer, and plan on spending several hours working and cussing. We talk to dozens of customers each year who in frustration decide they will do or pay almost anything to eliminate this back breaking work. They look at rolling docks and many other fancy options, only to find out that they are mega-expensive and most of them don't work nearly as well as advertised. Most of these people are unaware that a properly designed conventional dock can be installed in about 3 minutes a section without any augering or heavy lifting, even in muck! The fact that they can save thousands of dollars while retaining the flexibility of nearly any configuration is icing on the cake. No matter what style of dock you have, remember that if it's not light, it's not easy. Old splintery, hot, all wood sections often weigh 200 – 250 pounds, more if they're wet. Alumi-Span offers over 25 different sizes and styles of dock sections ranging in weight from 45-150 lbs. All aluminum and vinyl docks are by far the lightest; however Alumi-Span also offers a cedar option with weights just slightly more than our all aluminum or vinyl sections. Cedar saves a lot of money as compared to the more maintenance free materials and it is still significantly lighter than a pine dock. Many conventional wood docks and some aluminum frames ones do not have a stringer bracket to connect the dock to the crossarm. A dock like this has to be augered or the poles would fall over. Adding stringer brackets and bottom plates to an existing dock with conventional augers can automatically take a lot of the work out of it. OK you say, but that's for a dock with bottom plates and I have a pontoon boat that I tie directly to the dock in high winds. I have to auger, don't I? ....... In most cases you don't. You can simply install our inexpensive permanent augers. These rugged units are designed to be left under the ice all year creating a permanent underwater base for our regular post to fit into. It's just as fast as bottom plates and gives you the added option of dropping fully assembled supports into the bases first. You can use a combination of permanent augers and bottom plates depending on where you need the support of an augered post. Alumi-Span also offers large bottom plates for areas were a larger plate is needed. These can be especially useful for installing trusses, as just like the permanent augers the large bottom plates will allow you to stand the trusses up and simply lay the sections on them. 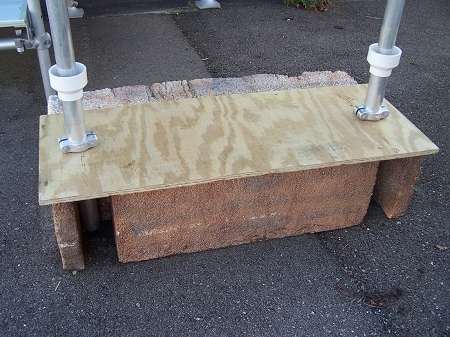 A properly designed dock using these components only requires you to remove or tighten 4 bolts per section when installing or taking out your dock. You say that's fine for beach conditions but what about heavy muck, that can't be easy? Alumispan's famous Big Foot system makes it just as easy. These units work just like Perma Augers but they are designed to push down into muddy bottoms. Once installed they form a permanent underwater base that not only facilitates installation but also gives you something solid to stand on when you're in the water. Additional advantages of both permanent systems are that they place the dock for you perfectly every year and you never have to adjust anything. You can also put the farthest section in first and build back to shore since you know exactly where it will go. Also, if you absolutely insist on conventional augering, just use a few right where you tie your boat. The rest can be bottom plates. The deeper you go, the tougher it will be to put in. Look, we love to sell long docks and putting a dock in in 8 foot of water is doable, but 3 to 4 feet is enough for any inland lake boat. You will probably be putting your dock in while the water is still cold. Once the water gets deeper than 4 feet it will be over your waders. This can make the temperature in your waders become very uncomfortable. In 3-4 feet of water, the uprights will be short and stable, and you probably won't need additional diagonal bracing. If you can't go straight out and still have enough room for your boat without getting into deeper water, try using an “L” design so that the boat can sit parallel to the shoreline. There are many ways we can design a dock to accommodate a boat without making the dock tough to put in so please contact us if you are in need of design ideas. When you receive a dock from Alumi-Span you will receive a kit. 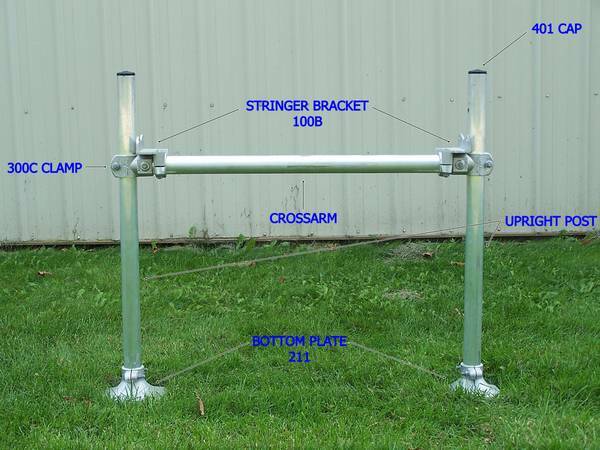 A basic dock kit will include dock sections, crossarms, upright post, bottom plates, stringer brackets, and caps for the post. The first thing you should do is pre-assemble as much as possible. In subsequent years you will not have to do this preassembly. Start with the crossarms, which will already have the post clamps on them. Take the stringer brackets (100B) and attach 1 to each end of the crossarm. Don’t tighten them completely at this point. Set it aside. Take all of the bottom plate halves and using 2 carriage bolts loosely connect the halves together. Now put the upright post into the plates. Leave 2-3 inches of the post sticking beyond the bottom of the plate unless you are on rocks. This will make the dock even more stable. Now that you have the post with bottom plates assembled, loosen the clamps on your crossarm, slide the posts in to the desired height and just snug the bolts back up. It is easy to adjust the height once the dock is in place so for right now having the crossarms at approximately the right level is fine. You now should have what looks like an “H”; we call this a standard assembly. The only thing left will be the caps for the post and you want to wait until the very end of the project to put them in. You are now ready to install the dock. Have someone help you lift the first section to the lake the beginning of which will normally sit on a break wall or directly on the shore. Next lift the other end of the first section up and slide the first standard assembly under it. You will now loosely fasten the stringer brackets to the section by putting one 1” hex bolt into each side, the holes should line up. Assuming you are going to have more sections, position the assembly so that two sections can share the stringer brackets. At this point you can adjust (or ramp) this section up or down to the level you will use for all other sections but never ramp more than 8” per section. IMPORTANT : The dock must be high enough to never allow waves to go over it. On a small lake this could be as little as 8” but on a very large lake or a lake with changing water levels this could be as much as 2’. Neighboring docks can give you a good idea of what is appropriate. Take the next standard assembly and walk it out into the water. Make sure it’s close to level with the section you just put in and set it the length of the section away from the last one. Either float or carry the next section out and put it onto the other half of the previous standard assembly. Repeat steps 9 and 10 until you are done but on the last section the standard assembly will be placed behind the dock end to make room for a cap and you will only use one set of stringer bracket holes. Once the dock is in place you will want to make sure it is level. Level it by loosening the bolts on the 300C castings. The pole will easily slide up and down. A small level used in both directions works good but measuring to the water is even better if the water is calm. Once level tighten the 300C back up. Now go around and all tighten all the bolts. The stringer brackets (100B) are the main suspects here. You need to tighten the bolt’s attaching them to the dock and the two bolts holding your stringer bracket to the crossarm. You now should have a completed basic dock install. Let the dock settle for a few days, if it’s still level, you may want to trim the tube all to the same level with a 2” tube cutter (they can be purchased inexpensively at Lowes or Home Depot) and finally push the black post caps in. NOTE: Number the standard assemblies with a magic marker so that next year they go in exactly the same way. Augered installations are similar to the bottom plate instructions above but with some differences. Instead of completing the standard assembly as above, you want to first preassemble the augers into the poles. Next, attach the crossarm assembly complete with stringer brackets (but without poles) to the end of the section to be installed using two 1” bolts provided. Remember that except for the last section the crossarm will stick out beyond the end so it can share the next section. Walk the section with out to the water and prop up the end. A vertical pole with a stringer bracket mounted temporarily to it can be handy for propping up this end or just have another person hold it up. Take the clamp(s) off the crossarm assembly and hold the first auger pole about 1/8” away from the one of the ends. Make sure the poles are vertical (holding it loosely from the top, let gravity make it vertical). Auger the pole about 1’ into the ground (plus the auger), or until it starts to turn fairly hard. At this point you can now put the clamp back on and tighten it up. Repeat this process for the other side. With augered poles you can adjust the height simply by augering more or less; therefore you can put the caps on immediately. Typically you use an inexpensive turn bar to auger but if you have several poles to auger, a pier post ratchet saves a lot of work. Caution: Don’t use any type of pipe or other locking wrench as that will leave sharp burrs on the pole.